Iconic Australian rock and roots music artists rally to help Brisbane musician Danny Widdicombe celebrate 20 years of living with leukemia and his 40th birthday. “Living with cancer for 20 years is an achievement worth celebrating – and what better way is there to celebrate than put on a show and make music with your friends?” Says Danny. And so it began. Brisbane’s best new music venue, The Triffid was booked, musical friends arranged and the date confirmed – Saturday 28th November. Luke Daniel Peacock plus some platinum record selling surprise guests yet to be announced. “The Last Waltz” was the farewell concert by the iconic and cult band known simply as The Band. Their last ever show was documented on film by the legendary film director Martin Scorsese (Taxi Driver, Goodfellas, Raging Bull…) and included such special guests as Neil Young, Bob Dylan, Joni Mitchell, Neil Diamond, Van Morrison, Eric Clapton and more. The film and accompanying double album are ranked as one of the greatest recorded live concerts of all time due to the sense of celebration and camaraderie that the performers radiated on stage. Not only were the guests and performances outstanding but it was also the songs themselves that made this concert such an instant classic. Songs like ‘The Weight’, “The Night They Drove Old Dixie Down”, “Up on Cripple Creek” and Bob Dylan’s classic “Forever Young” are all staples in the rock pantheon and have stood the test of time, remaining as fresh and full of passion and emotion as when they were written. This is the Birthday party to end all birthday parties. Danny Widdicombe is turning 40 and celebrating his 20th anniversary of surviving leukaemia on the same night! 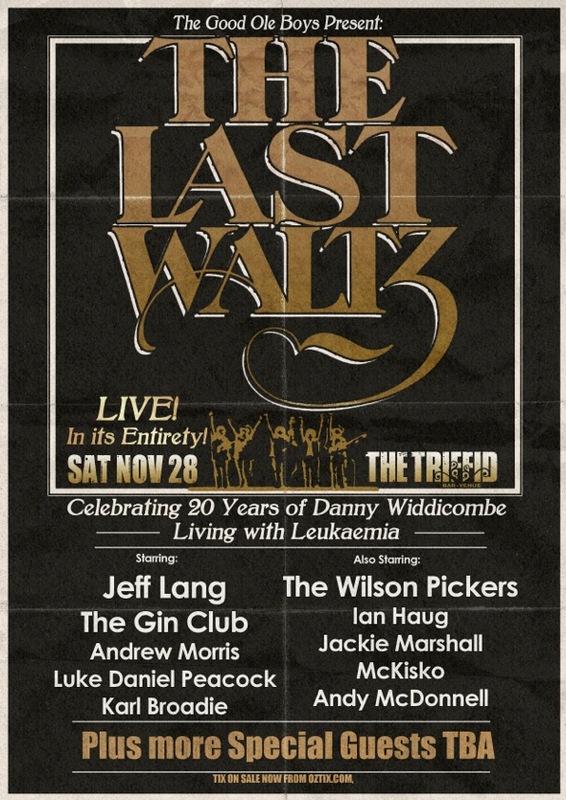 Danny and his band The Good Ol’ Boys will be performing The Band’s classic concert ‘The Last Waltz’ in full with a stellar line up including Bernard Fanning, Troy Cassar-Daley, Jeff Lang, Gin Club, Wilson Pickers and more! Get Down!